School insurance plans or my own insurance – which is better? When looking for insurance coverage as an international student in the USA, there are often a few options for you to consider. The three most common ones are outlined in our “School health insurance in the US” insurance explained article – but basically it boils down to a school mandated plan offered by your school, a school sponsored plan (also offered by your school), or the option to choose your own plan. With a school mandated plan, you have no choice but to take your school’s insurance plan. It is often included in the cost of your tuition, and you are automatically enrolled into it when you start classes. With a school sponsored insurance plan, your school might allow you to purchase your own insurance coverage, but that plan will often need to meet certain benefit levels before it will be accepted. This is known as a waiver or compliance form. With the third option, you have freedom to choose any insurance plan, and sometimes that plan will need to meet certain levels of coverage. When you do have the option to purchase your own coverage, you will need to ask yourself, “What is the better option for me?”, and with this blog post we will outline some of your main considerations. School insurance plans vary, but one thing is for sure, you have no control of the type of plan they offer and the plan benefits. You will also not be able to change, adjust or pick a better plan that is more suited to your needs. In most cases, schools will always try to offer the best coverage possible, however when you have high benefit plans (some that could be ACA compliant) this often leads to higher premiums, and sometimes higher out of pocket expenses. You also have to consider that there could be benefits and limitations within the policy that do not meet your needs. Again, you have no control over this. With purchasing your own insurance plan, your school might define some benefits your plan will need to include, but aside from that, you should have the choice to find a solution that works for you. There are a number of different options and providers that can offer a range of benefits and lower or no deductibles to suit your needs. In short you will have choice and control to find a plan that works for you, and includes the benefits you want. 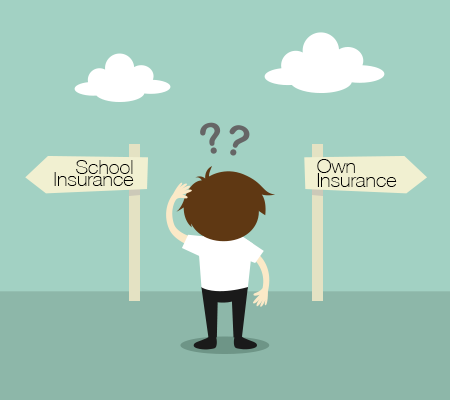 The cost of your school insurance versus your own insurance plan will probably be a leading factor in whether you opt for one option or another. The cost of school insurance plans keeps going up, especially if you school plan is an ACA compliant plan. While the benefits might be more comprehensive, that has also meant that prices need to rise accordingly to compensate for these plans with better benefits. Some school plans are now costing up to $2,500 per school year or more. If you purchase a plan on your own, you have the control to find a plan that fits inside your budget. Individual insurance plans that you purchase on your own can be as low as $300 or $400 per school year for the more basic levels of coverage, and then move up from there. This allows you to find a plan that works for your budget and benefit requirements. It may require a little bit of research to make sure the plan is going to work for you, and you are aware of all the benefits and limitations – but it can be a great way to save money! While benefits and pricing are a good reason to look at other insurance options, you also have to look at your own personal situation. For example, if you have an existing medical condition, many of the options that you can purchase on your own will not include coverage immediately for that medical condition – they will often have a waiting period before they will cover those benefits. If your school insurance plan is an ACA compliant plan, then these benefits will be covered immediately with no waiting period. So although you might save money with another option, your school’s insurance plan will provide you with the coverage you need. Another good example is if you are bringing over any family members with you, such as your wife/husband and children (otherwise known as your dependents). Some school plans will not allow you to insure your dependents on their plan, others will. If your school does not allow dependents, then you will need to search out options just for them, which sometimes can be hard to find if you (the primary student) is not insured on the same plan. You will either all need to look for a plan together, or just insure your wife and children on a separate dependent plan. As you can see, your personal situation might actually drive you towards one plan option or another, and might not actually give you a huge amount of flexibility, even if you did want to choose one option over the other based on benefits or price! At the end of the day, you will need to weigh your personal situation with the benefits and pricing of school or individual insurance plans to find the right balance. If you are looking to save money, purchasing your own insurance plan is often the best way forward as you have the ability to shop around for the plan that fits in with your needs and budget. However, as outlined above, there could be factors stopping you from doing that such as an existing medical condition or if you are bringing family members with you. The choice is a personal one, but hopefully this has provided you with some direction and advice on how to proceed. If you do have any questions, please let us know or post comments below. I am looking for an affordable health insurance for my boy. He’s 14 years old and holds a F2 visa. I’m also going to follow up with more information via email. Please let us know if you have any other questions.